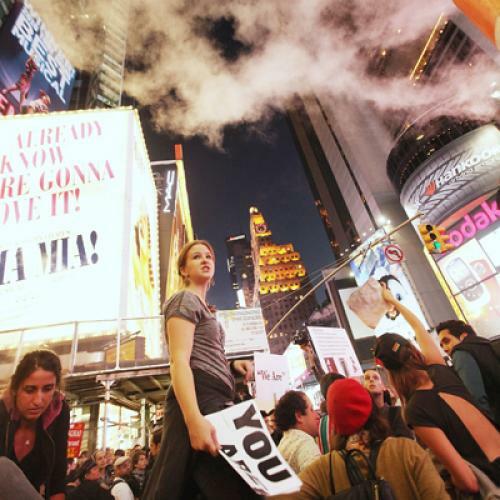 Much to everyone’s surprise, the Occupy Wall Street (OWS) movement has rapidly gained support and media attention in the short span since its emergence on September 17. Not only has the movement grown on Wall Street itself, but it has spread to dozens of cities around the country, with more joining everyday. There are even groups forming across Europe. So what’s driving it? Broadly speaking, it’s the belief that inequality of wealth and power is out of control and is undermining the welfare and future of the “other 99 percent.” This is a powerful idea and liberals should welcome it, since it happens to be true and accords with much of what liberals have been arguing for decades. And liberals should welcome OWS’ popularization of the idea even more because, on their own, they’ve had shockingly little success making economic inequality a fighting issue. The reason for this is that inequality as an issue has never gotten much beyond moral condemnation and complaints that current levels are unnecessary and unfair. The American public has largely agreed with this critique, but it has typically failed to make a strong connection between inequality and its own prospects for getting ahead. That connection is strengthening, however, as the economic downturn drags on, while Wall Street, the banks, and the economically powerful continue business as usual. OWS is building on this dawning recognition that inequality is not just bad or morally wrong, but a huge obstacle in the way of the other 99 percent’s future. Fighting inequality has gone from option to necessity: There is now no choice but to confront the economically powerful and somehow restructure the system to promote economic mobility. That helps explain why young people are so prominent in the OWS protests. It’s not just that young people like to protest; it’s that they are acutely sensitive to the issue of economic mobility. Young people are typically optimistic about the future but the current situation sorely tests that optimism, leading them to strike out against those who are in their way. Liberals should be delighted that the target is Wall Street, not the federal government, which has borne the brunt of populist anger up until this point. As close to a consensual view as you get in America is that “everyone in America should have equal opportunities to get ahead.” A whopping 97 percent agreed with that statement in a 2007 survey by political scientists Lawrence Jacobs and Benjamin Page. But Wall Street and powerful allied economic and political interests are making a mockery out of this commitment and, indeed, raising questions about whether anyone else besides them can get ahead, period. That’s the source of the populist anger—call it aspirational populism—that is driving this movement and will continue to drive it in the future, if it picks up steam. And that’s why, among Americans who have heard of the OWS movement, favorable views outnumber unfavorable by a margin of more than two to one. OWS is saying out loud what a lot of Americans are already feeling. The time is right for an outbreak of aspirational populism—OWS is now twice as popular as the Tea Party—and liberals should hop on board.